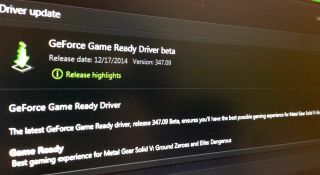 Nvidia has released its latest GeForce Game Ready drivers. It's a beta release, numbered 347.09, and offer performance tweaks for Elite: Dangerous and Metal Gear Solid V: Ground Zeroes. You may remember that earlier this week we called attention to a longstanding issue where Nvidia cards outputting through HDMI were being locked into limited RGB instead of full RGB. The problem didn't affect all displays, just those categorized under "Ultra HD, HD, SD" in the Nvidia Control Panel. The new driver finally fixes the problem, offering a toggle for Limited or Full RGB on the Desktop Color Settings menu. According to the release notes, the new driver also adds a new application profile for Project CARS and 3D Vision and 3D Compatibility Mode profiles for several games, such as Alien: Isolation, Far Cry 4, and Middle-Earth: Shadow of Mordor. The new drivers are available now through GeForce Experience and at GeForce.com. In GFE, make sure to tick the beta box to see the latest driver.